Madagascar is a biodiversity hotspot, hosting a multitude of wildlife species found nowhere else on Earth. Lemurs are among the four major radiations of endemic terrestrial mammals on the island of Madagascar, along with rodents, carnivores, and tenrecs. There are more than 100 taxa of lemurs; this, coupled with their island isolation, makes them a stunning example of diversification through evolution. The aye-aye is the largest nocturnal lemur, best known for its distinct appearance and unusual diet. The aye-aye has large radar-like ears and specialized middle fingers designed specifically for detecting and pulling out grubs from under tree bark. Its robust and ever-growing incisor teeth allow this uniquely adapted lemur to crack open hard objects, including nuts, in order to gain access to highly nutritious foods. 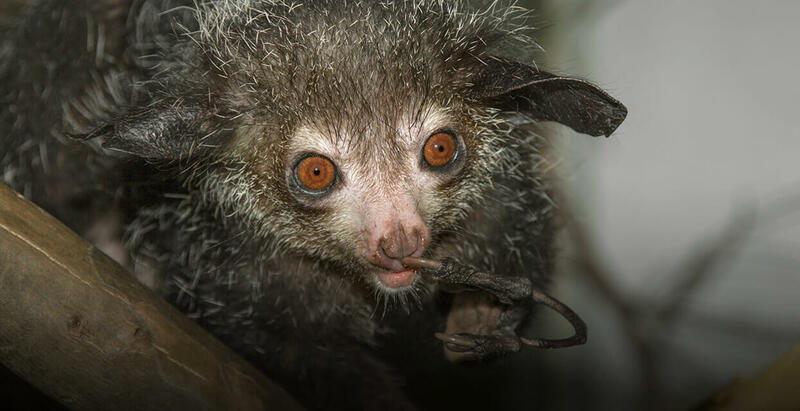 San Diego Zoo Global is working with our partners to protect the aye-aye in the primary forest of Maromizaha. Through our Global Partnerships team, we are building local scientific capacity and training rangers to undertake long-term population monitoring of the aye-aye and other native wildlife using both traditional and newer camera-trap methodologies. Because little is known about the aye-aye’s natural behavior in the wild, our research is aimed at better understanding its activity pattern and habitat preferences, as well as how this species is impacted by human disturbance. Additionally, we are working with local educators in primary schools adjacent to the forest through our Little Green Guards program to inspire children to care for their native wildlife and habitat. Our conservation expertise and commitment will help ensure a future for the aye-aye population in this area.